Those in wealthy nations often experience “First World Problems.” These are problems that come only to privileged individuals, who have no worries of food, shelter, or clothing. It’s the owner of the yacht who bemoans the cost of upkeep. It’s the Porsche owner makes a fuss when a can of soda is spilled in the back seat of his car. It’s those at their vacation home on the lake who complain of the sand that comes into the door from the beach. Those who complain in this way seem oblivious to their material wealth. They have a yacht! They have a nice car! They have a vacation home! They have things that most of the world could only dream of having. They really have no right to complain at all. Reminding themselves of how good they have it would help them to see how minimal these problems are. so that your youth is renewed like the eagle’s. (Psalm 103:3-5). Such blessings can easily be forgotten. That’s why David reminds himself to “forget not all his benefits” (Psalm 103:2). That’s why Paul instructs us to remember where we were before trusting in Christ. “Remember that you were at that time separated from Christ, alienated from the commonwealth of Israel and strangers to the covenants of promise, having no hope and without God in the world” (Ephesians 2:12). For a believer in Christ, complaining about the troubles of the world we face is like a wealthy man complaining about his first world problems. A genie is a magical creature of Arabian folklore, who is imprisoned in an oil lamp. When someone rubs the lamp, the genie is released, willing and able to grant wishes to the one who set him free. All sorts of stories result as wishes are granted by genie. The magic of the fairy tale is that it easily engages us into thinking of what sort of wishes we might make if we happened to rub a lamp and set a genie free. Would we wish for a new car or a new home or for millions of dollars? Would we wish for success or for health or for world peace? How wonderful it would be to have such a genie! At some point, however, we come back to reality, realizing that the genie is mere fantasy. Sadly, there are many who treat God like a genie who grants wishes. They pray to God, wishing for some good result in their life like health or wealth. Sometimes they pray in a crisis for a dying friend or for a wayward son or for an ailing marriage. But when God doesn’t act like a genie in granting their every desire, they give up on God, because he wasn’t working for them. Soon they come to deny God altogether, thinking that he is simply a fable. How foolish this is. It is based upon a faulty understanding of exactly who God is. He is not our servant, compelled to obey our every whim. Rather, we are his creatures, created to love him and obey him. When he does’t answer our prayers, it isn’t because he is inept or imaginary. It is because he has plans that we know not of. Let us submit our will to his. On the first Friday of June each year, it’s “Donut Day.” My daughter came into my home office on that day this year and presented me with a donut, saying, “Happy Donut Day!” Initially, I resisted. But, after a few moments of the donut sitting beside me, the temptation was too great. In fact, I went inside later and enjoyed another one. 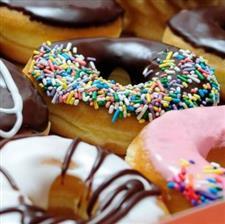 My eight year-old confessed later to having five of the donuts my daughter had brought home! God’s word is to be greatly desired. More than money. More than sweets. This was David’s experience. Is it yours?